By Wayne G. Sayles, 208pp. Paperback edition, illustrated throughout, tables, charts, maps. 1999. New, signed by the author. 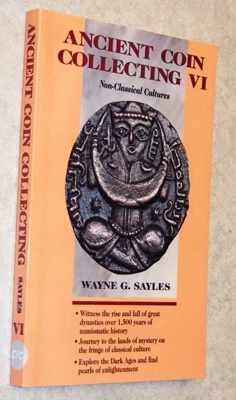 The long out-of-print final volume of the Ancient Coin Collecting series, now back by popular demand. Republished by Clio's Cabinet. For those who have the first five volumes, here is a chance to fill out the series. Covers coins from the Land of Sheba to the Court of Ghengis Khan and more. Also available here in a Hardback edition.